Winding Creek Campground offers 50 acres of unspoiled nature located in the center of the Big Roche a Cri Fishery Area in Leola Township, Adams County. Campers will find over-sized wooded campsites with water, electric, and sewer service. The mission of Winding Creek Campground is to create that special getaway for campers who seek a large and quiet place to relax and enjoy nature. Campers will have access to nearly one mile of meandering Class 1, Outstanding Resource Water Trout stream that runs through our campground. This is part of the Big Roche a Cri Creek and surrounded by the Big Roche a Cri Fishery Area* to the east and west ends of our campground. (A fishing license and Trout Stamp is required for stream fishing.) 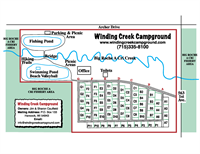 Winding Creek Campground has a private fishing pond. (No fishing license is required for pond fishing.) 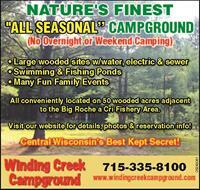 Winding Creek Campground also has a separate and beautiful sand beach and swimming pond for summer fun. Winding Creek Campground is home to abundant wildlife and birds where visitors can walk trails and enjoy these gifts.